"My biggest concern is that this is happening to other people, and IEHP is getting defrauded on a large scale." Tax payers are likely left footing the bill after a college student in the Inland Empire reached out to the I-Team, concerned that his Lyft account had been hacked for the purpose of Medi-Cal insurance fraud. Day after day, college senior Robert Williams was being contacted by Lyft drivers for rides he never ordered. "I'm studying information technology with an emphasis in cyber security," Williams says. Of course, there is irony in his choice of major because he believes his Lyft account was hacked, or at least compromised. "I do have a Lyft account, but I've only used it twice," Williams says. Normally, Williams drives himself, so the only times he used the popular ride-share app was when he was out of town. "Eight months ago, I started getting text messages, 'Hey this is your Lyft driver. I'm outside your house,'" Williams says. "The first time it happened, I got a little freaked out somebody is outside my house. I didn't order a Lyft." Thankfully, no drivers were waiting outside his home, but the text messages kept coming: "This is your Lyft driver, I'm outside;" "Hi, this is you Lyft driver, I'm waiting." And Williams got a ton of voicemails. It got so bad that Williams was receiving over 10 voicemails from Lyft drivers every week. But when he checked his credit card, Williams didn't have any charges. He was never billed. 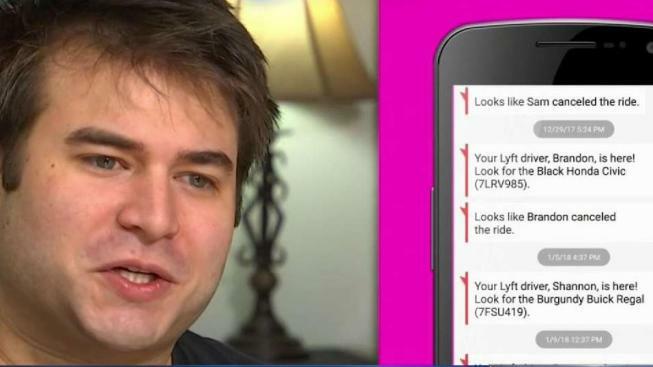 Emails he shared with the I-Team show that he repeatedly reported the issue to Lyft for investigation until his account was ultimately deleted last July. The text messages stopped, and the nightmare appeared to be over until he received a letter from the Inland Empire Health Plan, his insurance provider, stating, "We've noticed that you've requested a lot of rides and cancelled them, and we get charged for every time that happens. The I-Team reached out to IEHP, who responded, "The identity of one of our members was misused for unapproved transportation trips." "The care of our Members is our highest priority at IEHP. As you may already know, the State mandates IEHP to provide transportation services to all of our Members for any Medi-Cal benefit, including trips to and from home to pharmacies, medical appointments, dialysis visits, dental visits, behavioral health appointments and any other Medi-Cal benefit. For many of our Members, that can be multiple trips every week. "IEHP has determined that the identity of one of our Members was misused for unapproved transportation trips. All incurred expenses from the unapproved trips will be recovered from our transportation vendor so no public funds are at risk, and at no time was our Member impacted financially. We do apologize for the inconvenience that our Member experienced and have reached out to him directly. 1) We turned over the details of this case to our state investigators to review and take appropriate action, including law enforcement actions if appropriate. 2) The identified driver has been banned from providing trips for our Members. 3) We have required our transportation vendor to add stricter measures to authenticate our Members when they request transportation services." Williams says that he never used his health insurance to book with Lyft. "I didn't even know that was a thing you could do," he says. In an email to the I-Team, a spokesman for Lyft says, "We have a dedicated team that promptly responds to any fraudulent activity, we are currently investigating this issue and are reaching out to Mr. Williams' insurance organization." Williams has yet to graduate, but he deserves an "A" for his instincts, as his actions and disclosures started the investigation to stop tax payers from getting ripped off. Williams shares, "My biggest concern is that this is happening to other people, and IEHP is getting defrauded on a large scale." Neither the Inland Empire Health Plan nor Lyft has said how many rides were booked or how much has been paid to Lyft for these bogus rides. No one has been able to answer exactly how Williams' account was compromised and whether it's happened to anyone else.